Hone your math skills while playing games with this number puzzle. A Five, Six, Seven, Eight! Who said math couldn't be fun? Turn your mental workout into a game with Aristotle's Number Puzzle from the Great Minds series. Named for the great, Greek philosopher and founder of Western science, this puzzle contains numbered tiles that must be arranged to give the same total in each row. 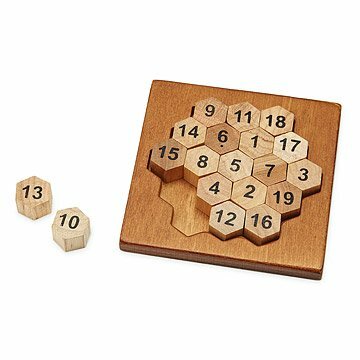 Sure to keep your mind and your hands occupied, this puzzle is made from wood that is finished in an antique style to give an aged appearance. Designed to engage the psyche, the Great Minds series brings together intellectually stimulating puzzles with some of the greatest thinkers from throughout history. Each puzzle reflects an aspect of the "Great Mind" who inspired it, as well as a brief history of their life and achievements, combining learning and play. Perfect for any science whizz or history maven, keep these alluring puzzles out in the open—they'll attract and keep the attention of your friends! Made in China. My daughter loved it! Exceptional quality and price. Challenging! It is a great gift however it'd be more fun if the answer wasn't in the picture above. I wanted a puzzle to challenge my fiancÃ©e and that she wouldn't finish in one sitting. Mission accomplished! I haven't played it, but he has. It's a fun game and it's great to leave out on the coffee table for anyone to grab ahold of and toy with. For the person who has everything and likes to keep their mind sharp. Very well made. Would recommend. Good quality version of a classic puzzle. It will be a gift. We think our grandson will enjoy the challenge. A wonderful gift to my 77 year-old father that is great at all puzzles. I'm addicted to solving this puzzle! I am addicted to trying to solve this puzzle. There has to be a logical way to solve it and I haven't yet figured it out. I love to play random matching/strategy games and I chose to work on this puzzle instead of those games. My only slight issue is that some of the wooden number pieces have rough edges and have scraped my skin (but I have since sanded them down myself). I will beat the puzzle one day, I am determined!